I will forever be a Seattleite at heart. Forever. My pre-baby days were spent living and working in Seattle. Everything I could ever need or want was within four blocks: a coffee shop, an ocean view run, and a Saturday morning yoga class. All the important things a city girl needs! Those years were blissfully fun, although I am, without a doubt, meant to be married with kids. It’s what I’ve always wanted, yet I know it’s not a given in life, so I feel extremely grateful to have Steve and Abby. Sunrise to sunset, I continuely thank God for those two. 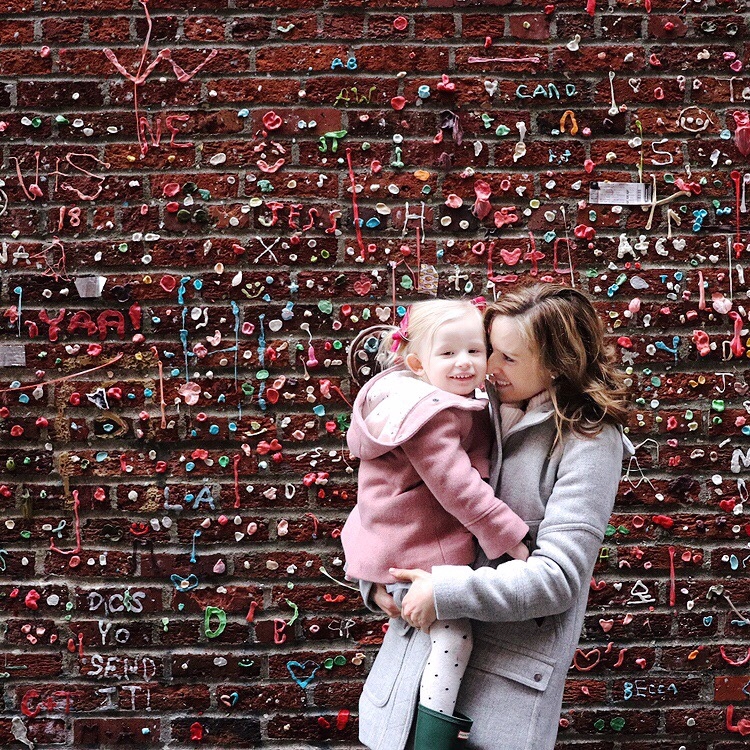 Although we don't live in Seattle anymore, the city still holds a piece of our heart, which is why I'm really excited to share with you some great places to take your little ones! I divided up these great places into two lists: one for a rainy day and the other for sunshine, along with a few general visiting tips at the bottom! 1 hour max! The market is one of the busiest and lively places year-round. And for good reason! A lot is going on, including all the market vendors setting up early in the morning and taking everything down every night. I still can’t believe they do this! 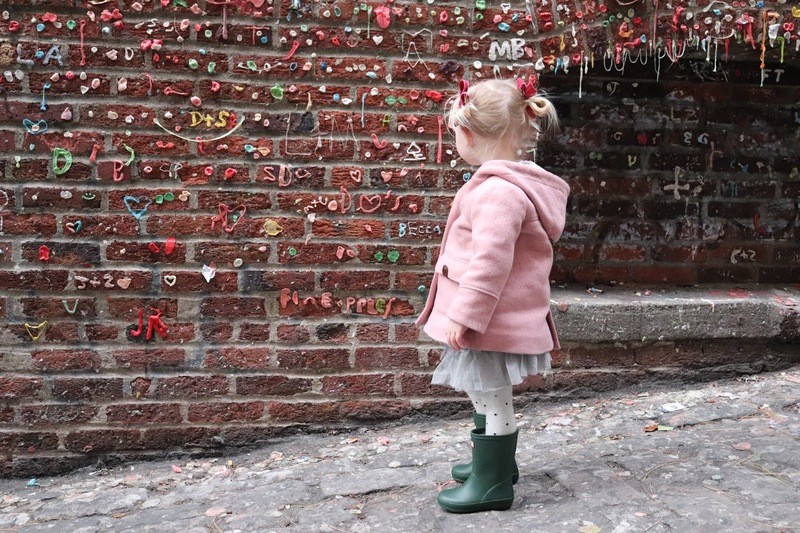 Below are a few highlights listed in order of how we walked through the Pike Place Market with our toddler during our last visit. Starting from the parking garage. - Walk street side of the market, passing the very first Starbucks! It’s like an outdoor museum. Quiet, open, and filled with dog walkers and families on the weekends. I really love this one because it’s right on the water and next to one of our favorite coffee shops, Uptown Espresso, home of the Velvet Foam. 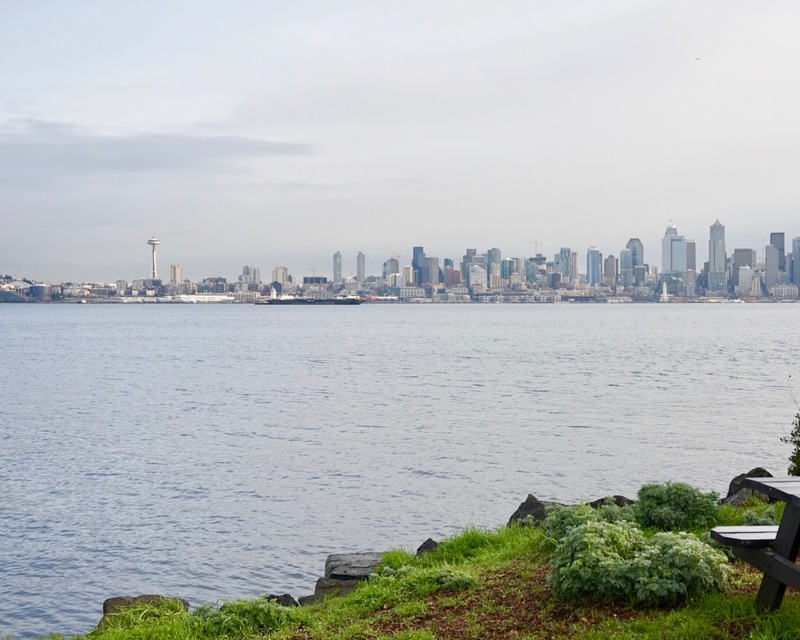 Highlights: Beautiful sculptures for countless photo opportunities, tons of grassy spaces for a picnic, a mini beach to toss rocks into the Puget Sound, and almost the entire walking path is right up against the water. Stroller or on foot, Olympic Sculpture Park is a good one! Not afraid of heights? 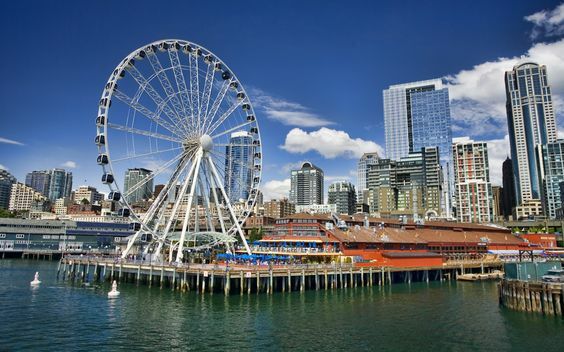 The Seattle Great wheel is a great way to see the city while getting away from the noise and crowds of the boardwalk. It's a long walk from the sculpture part and coffee shop as I mentioned above, although it’s doable with a stroller. Highlights: We like it because it gives us a chance to kick up our feet and rest with a gorgeous 360-degree view of our beloved city. Fantastic photo opportunity! Really a secret if you ask me. There are steps right next to the Park which lead down to a little playground for kids. We ended up going up and down on the slide with Abby in our lap three times and called it a visit. The playground below Kerry Park is really meant for kids 4 and up which may apply to you. 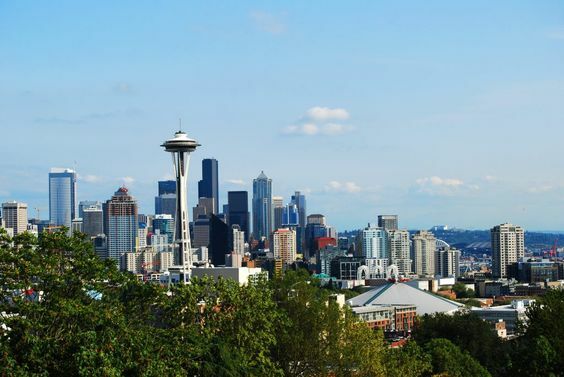 Highlights: The main event is again, the view: a fantastic photo opportunity to get your family in front of the Space Needle and Mount Rainier. 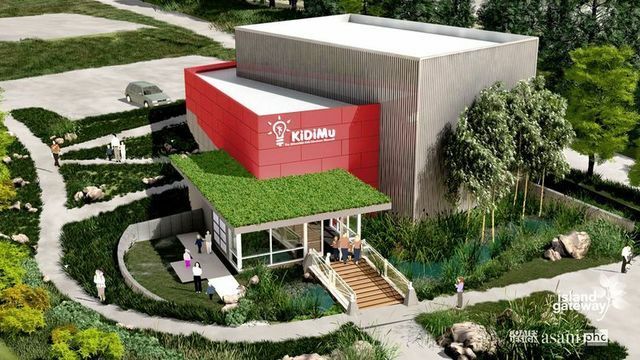 Plus, there is a wide-open patch of grass for kids to run around in. Picture large beautiful trees and plants framing the entire zoo and every pathway. At the entrance when they offer a map, take it! The walk ways consists of multiple zig zags and are to me, very narrow. We actually got lost during our first visit. Highlights: You truly feel as if you are in a jungle or forest, completely isolated away from the city. Weekends can be busy, especially sunny afternoons. It's a great stroll if you have a baby (0 – 11 months) and or a great opportunity to practice noun pronunciation with toddlers (12 months – 2 years). I loved watching Abby discover new animals. Making all those animal books come to life is really rewarding, for both of us. 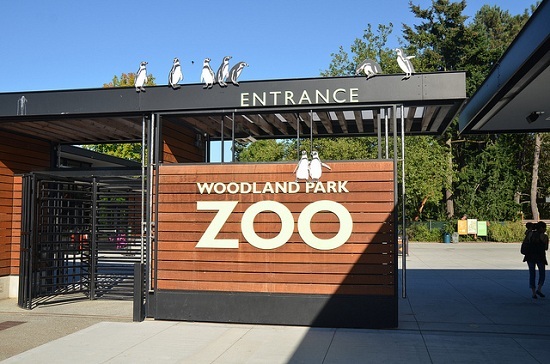 This is also a possibility if it rains, since The Woodland Park Zoo now has a "rain hop map" provided. Sandy beach and great food! It also has wide sidewalks and bike paths for pedestrians, strollers, (and double strollers), joggers, and coffee walkers. Everyone can easily share the multiple paved boardwalks all along Alki. Highlights: This is another great photo opportunity to get your family in front of the Space Needle and entire down town Seattle sky scrapers. Along with decks to walk out on, pockets of grass to pic-nic on top of and a few rocky shores to toss rocks! 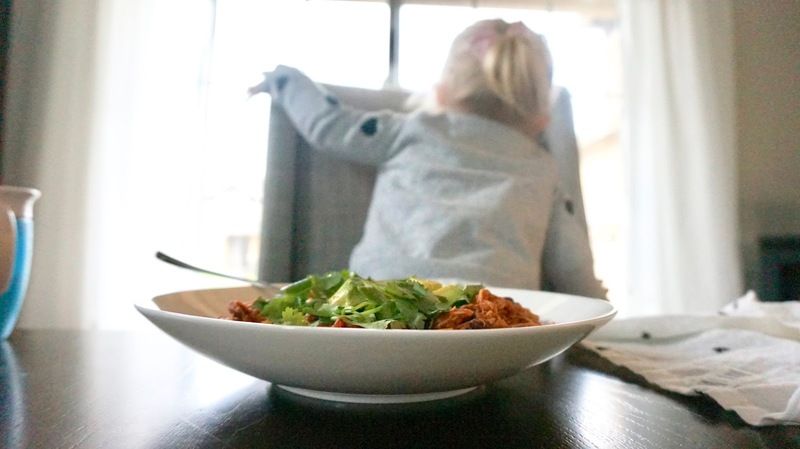 Our favorite place to take Abby to eat is the Marination Ma Kai, because we can “Pay-N-Dine-Dash,” meaning you, pay, eat, and leave when you and your little one is ready. No waiting for a waiter and awkwardly trying to keep your little one quiet with tons of people around you. We sat on the tables outside (open seating) and left when we were ready! This one is pricy in my opinion, though it’s a great walk through if the weather is rainy. 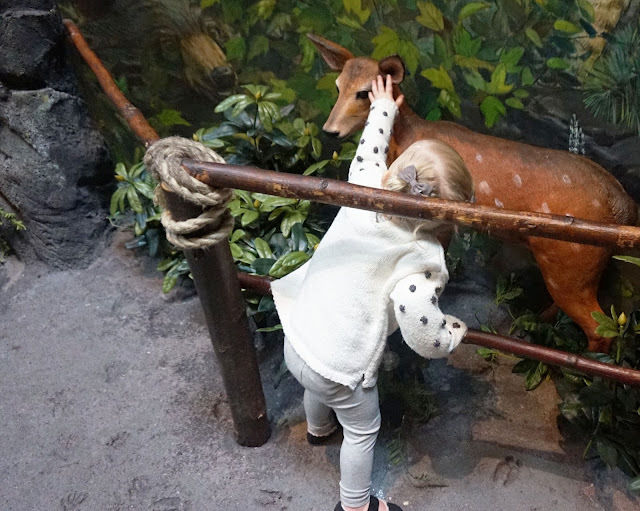 Our favorite exhibit was the “Life on the Edge,” because Abby loves water and anything she can touch! If that sounds like something your kid is into, go for it! It’s all about sea creatures, more specifically sea creatures from the Puget Sound. We really enjoyed watching Abby explore here at The Seattle Aquarium. 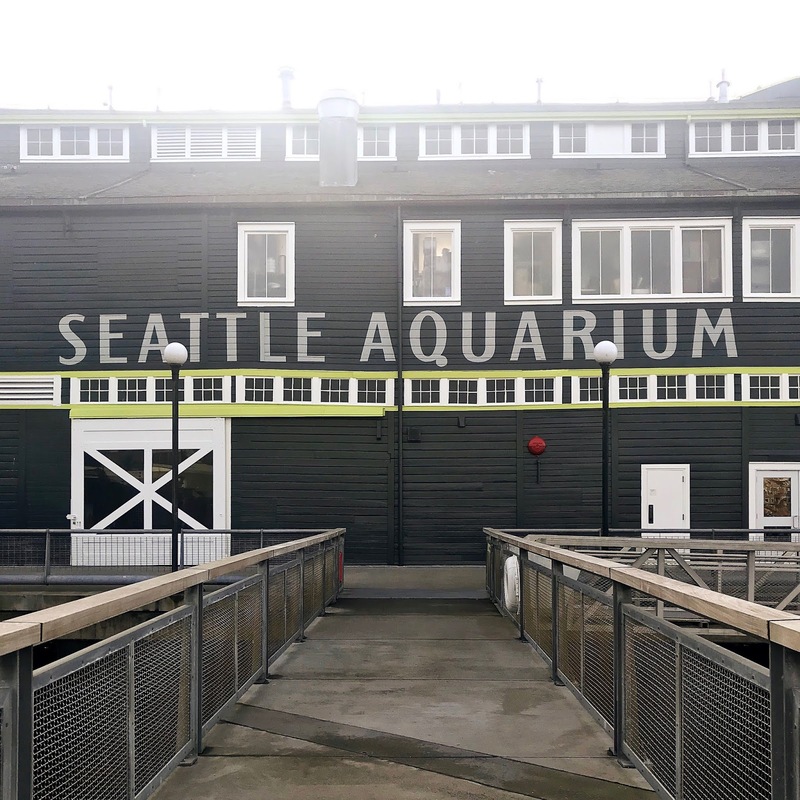 Highlights: Getting out of the rain, along with the popular oversized fish tank, Life on the Edge exhibit, octopus, and otters. A great interactive, hands-on experience designed for children aged 10 months to 10 years. The all-day stamp pass is amazing! We got there when it opened, 10am and took a break for lunch at 11:30am on the second floor in the Market Place. There’s lots of food options to choose from (of course Starbucks!) and they even have a few miniature chairs and tables for little ones. Just make sure you get your hand stamped! This allows you access back into the museum all day. Any time! Highlights: Everything! Our favorite exhibit was the Discovery Bay and miniature forest in the middle of the museum design, which is designed for ages 3 and under. We spent almost the entire time in these two sections since everything is created with Abby’s age group (19 months) in mind. Objects are placed extremely low, everything is hands on, colorful and they even have designed sitting objects and seats for parents that are scattered throughout the entire thing. Thank you, Seattle’sChildren Museum! We have not yet taken Abby here, though I hear great things about it from a friend of mine that just took her daughter last month. I thought it was worth mentioning since it's designed to include little ones under 3. It’s next on our list, and I promise to update this section when we go! If you are thinking about going, I thought I'd link the website for you here. I wrote two separate blog posts on tips for getting out and about in the rain with a baby here and a toddler here. I would read whichever one applies to you before you go and yes, it’s true, rain is possible year-round! However, the absolute best time to visit is somewhere between end of June-October. Summers are late to arrive and the rain is usually just the size and feel of sprinkles during those months. Car. Why? Because a parent’s comfort is key and I’m not just talking about your feet here. The kind of flexibility and storage space a car can offer is priceless for us! We always park in a parking garage at least once or twice during the day just so we have the possibility to bring or leave anything we want as our adventure unfolds. This one may be just a personal preference, but we really liked taking the stroller to the Sculpture park, then leaving it behind later that morning as we walked into Pike Place Market. 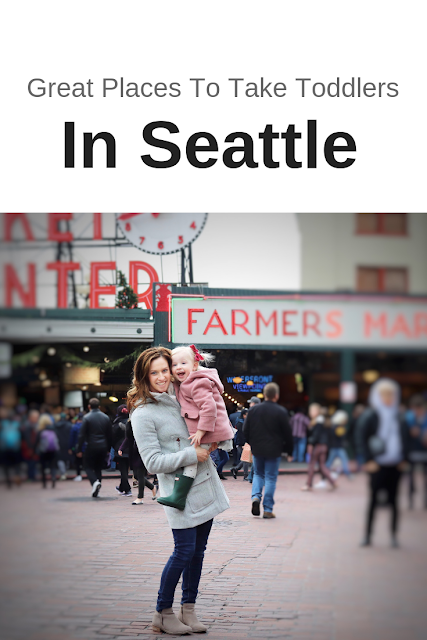 It’s always crowded so I would let your toddler walk or place your baby in the wrap for crowded sites like Pike Place. Last week, after watching the fish toss and placing bubble gum on the famous gum wall, we ended up putting our coats in the trunk. Stick to what you feel is most comfortable to you and it will all pay off as you navigate and find your way through the city. Walking is the easiest mode of transportation, yet having the car for storage to hold the stroller and all those extra things like flowers, coffee and souvenirs was great! As I mentioned above, comfort is key! Down town Seattle has lots of one way streets and although it is very intimidating for anyone who hasn’t lived in the city there is a pattern to how the streets are designed. I would suggest going to Google Maps so you get that top-down view. This will help you understand how everything is laid out (before you go). Heads up! Seattleite drivers are a bit aggressive and will not be afraid to use their horn. To them, they are important and they have places to go. So, keep this in mind if you are honked at or someone gets angry with you. The city has been booming for the last couple of years and they aren’t very nice to tourist trying to find a parking spot or for anyone who is lost. Give yourself grace and know that you are among thousands of tourists in the city on a daily basis. It’s not you; it’s them. You have the right to find a parking space and get lost! You do you. Stand tall! Eating out with Abby became tricky once she started crawling and then things really took a halt when she started walking. What we have found, though, is that going to places that are quick, let you pay up front (no waiting for a waiter), sit wherever you want (open seating) and leave when you’re done is our kind of place. "Pay-Dine-N-Dash," is what we like to call these restaurants. The restaurant I listed earlier under “Aliki Beach” is quick, yummy and provided us a gorgeous view as we ate. I highly suggest looking for these types of places to eat when bringing a crawler, walker, or toddler. The Pike Place Market also has lots of quick dining options like this and a gorgeous view may be a bonus! If the weather is sunny, we always do picnic style. I was honestly really surprised to hear so many of you would be interested in knowing exactly where you can go in Seattle! So, for our next visit, I’ll be sure to document more photos! This is a very broad overview of some great places to visit with little one’s. If you have any questions, let me know. I’m happy to help! 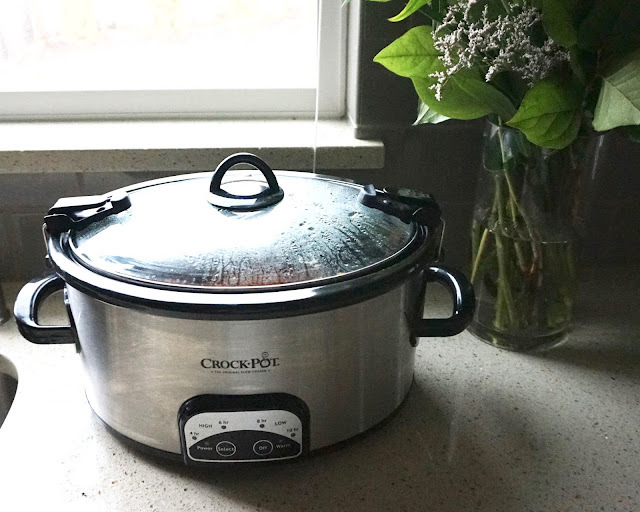 Whether your choice of meal prep is a crock-pot, stove-top, oven, or microwave, hopefully the ideas listed below help get you back to enjoying the art of cooking (or crock-potting) again! 1) Place chicken breast in the bottom of the crock-pot. 2) Drain all canned foods. 3) Pour all canned food and ingredients listed above over the chicken in your crock-pot. 4) Cover and cook on low for 4-8 hours depending on your desired time frame for that day. 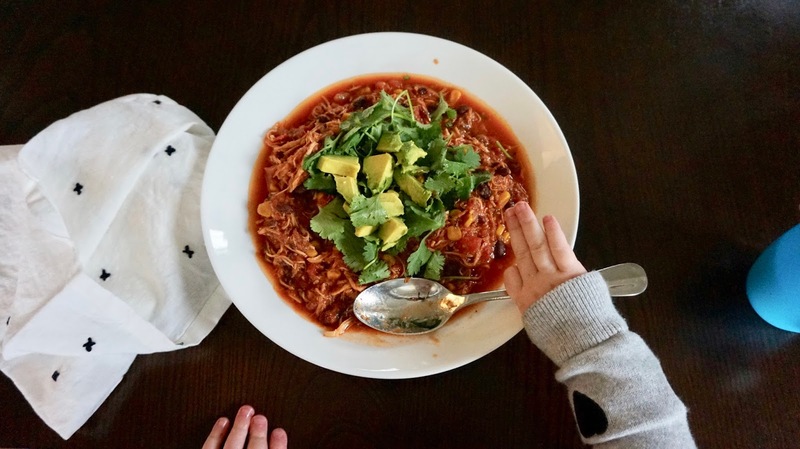 5) Serve chicken tortilla soup in individual bowls with desired toppings. Mama Cooking Tip 1: Place your little one in a playpen with toys they only see during this part of the day. They will start to expect what’s happening and look forward to seeing these special toys. Mama Cooking Tip 2: Pots, pans, spoons, bowls, and Tupperware are all purposely positioned on the lower-level inside drawers and cabinets so that Abby can "cook" with me. This method has worked for months! 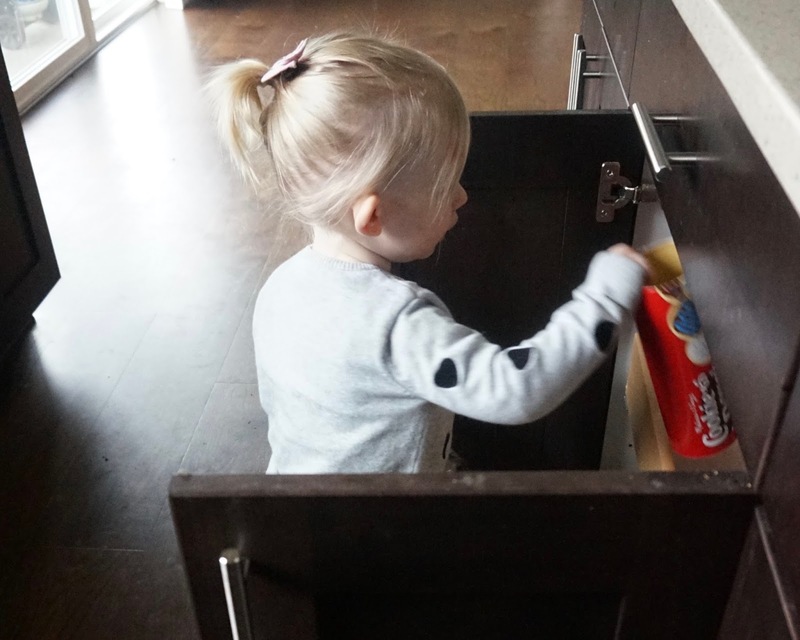 Even as a toddler at 19 months, she will still play with these things while going back and forth from those cabinets to her own little play-kitchen we upgraded for her. Mama Cooking Tip 3: Give them a bowl or taste of what you have. 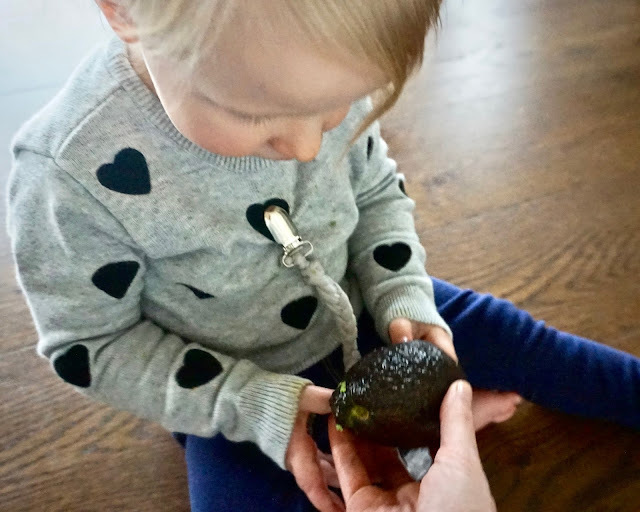 Food is all about sensory play for little ones, so I love encouraging it with Abby! For some recipes, this can be challenging. So I often hand Abby a piece of a red pepper, cucumber, cheese, basil, or piece of bread just to let her touch what I'm touching and see what she's smelling. It's a great opportunity to be a part of the cooking process, without actually "being" part of the cooking process! 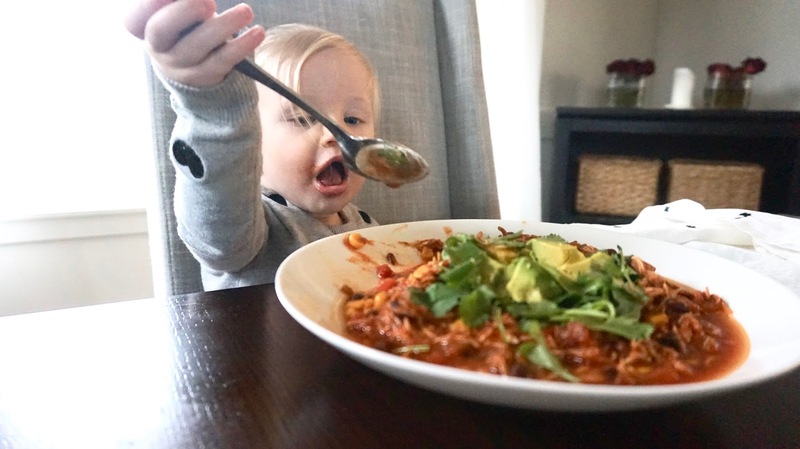 Mama Cooking Tip 4: Toddler? 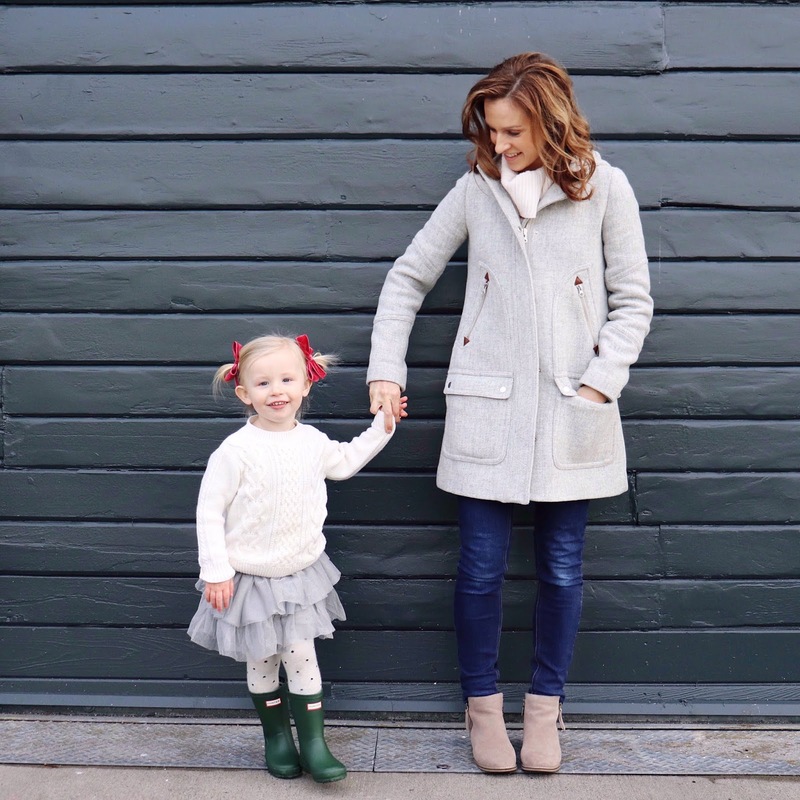 Tell your little one exactly what you're doing! They really want to learn about nearly everything you're doing. I have found that 9 out of 10 times that Abby is frustrated it’s because she's trying to see, do, ask, or touch something that’s out of her reach. Explaining as you go along again, helps them feel like they are "cooking" with you. 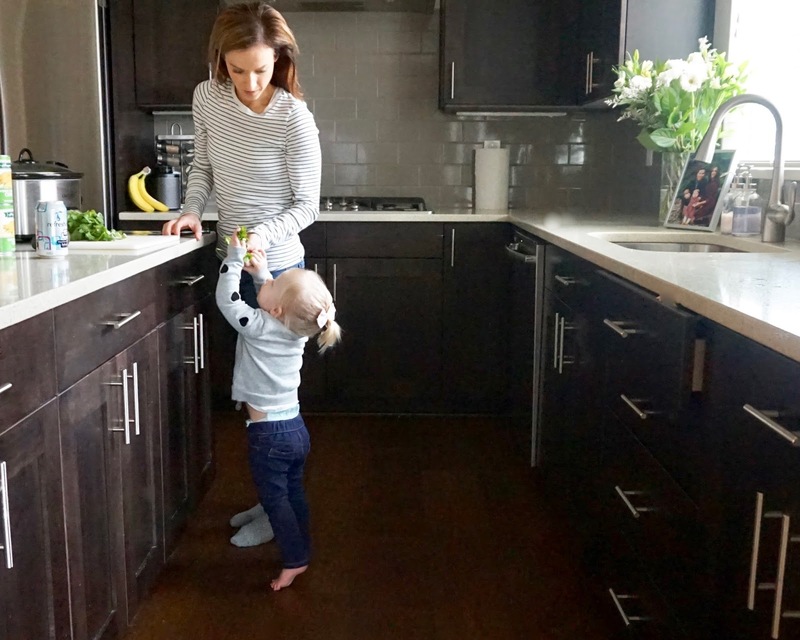 Mom Cooking Tip 5: Is your little one crawling or walking? I was gifted a Minnie-Mouse walker from a friend and decided I would place Abby in that thing for the 15-20 minutes each night just so I could cook. Safely. Mom Cooking Tip 6: KISS: Keep. It Simple. Sally. Yup, any recipe I'm looking at has to line up with this saying. I don’t cook dishes that take longer than 30-50 minutes. Why? Because there's only so much I can do Monday through Friday when I'm cooking solo. Anything longer than that is too much for me to take on with a little one close by. And you know what? I'm ok with that! It's a great problem to have. For those of you with two little ones, what are your tips? I would love to hear them below! I love a good tutorial that breaks down exactly what someone did while also including links for everything they used! This has been challenging for me to find on Pinterest because I love creating things with my hands. 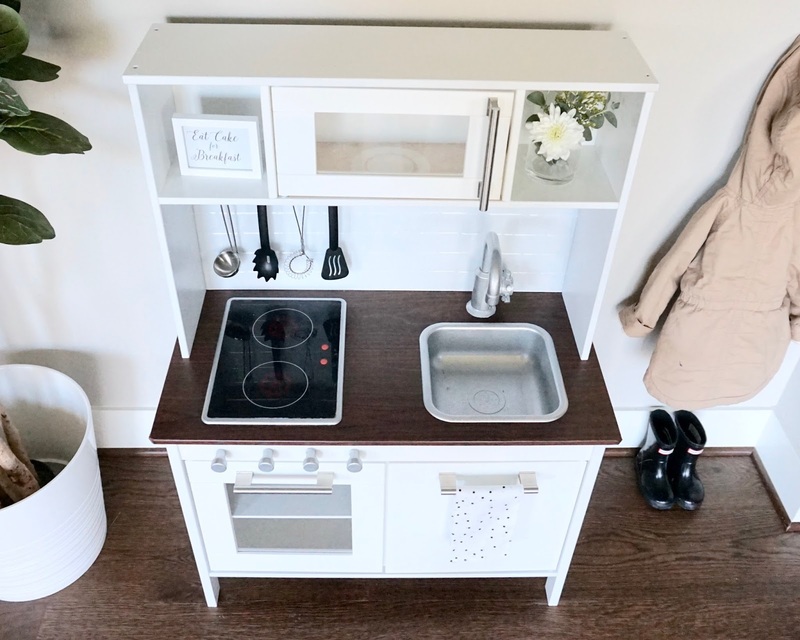 So, I'm really excited to share with each of you how we designed Abby's play kitchen! 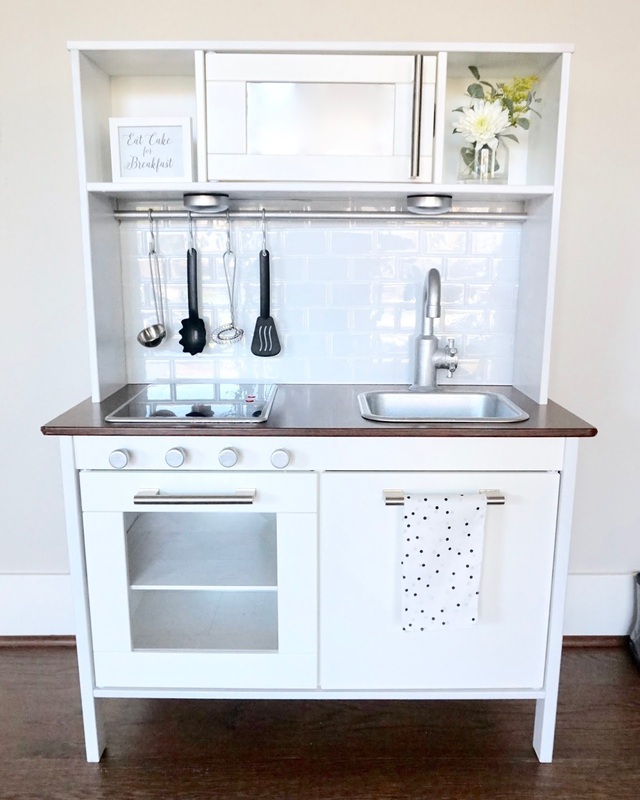 There are a ton of ways you can upgrade Ikea play kitchens, yet I encourage that you do so in a way that goes fits in with everything else among your home. Steve and I are very pleased with how everything turned out because it matches our home decor. I do feel the need to let you know up front: a whole lotta love went into this beauty! But when I see Abby enjoying every little detail we added, and playing so intently in it, my mama cup fills right up! This project took us a total of three days to paint, dry, build, and top with details. We scored the kitchen for $60 around Ikea's Friends and Family sale and the rest of the materials were $70 since we already had spray paint. The back-splash feature was the biggest ticket add-on purchase, but we really wanted a complete look. We're so glad we splurged for it! The more details you add, the higher the cost, but we were able to create a modern-looking kitchen for far less than if we had purchased a finished piece elsewhere. Below I listed a step-by-step guide to help you make one of these beauties for your own little one. From me to you, here you go! 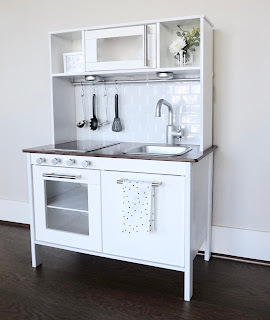 · Poster Board (White) 36" by 48"
Spray paint with primer all of the non-white parts of the kitchen, including the sink, brim of the stove, and the oven knobs. Spray paint white, everything you already painted with primer in Step #1. 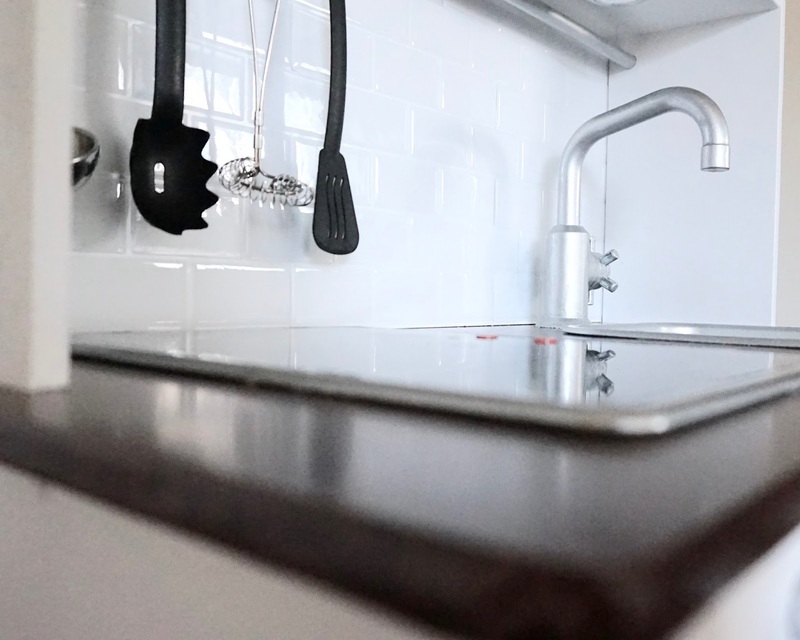 Spray paint metallic silver the sink, brim of stove, utensil hangers, utensil pole, and oven knobs. Coat all of the details spray painted white and silver with clear sealer (top coat). Let everything completely dry for about 4 hours. 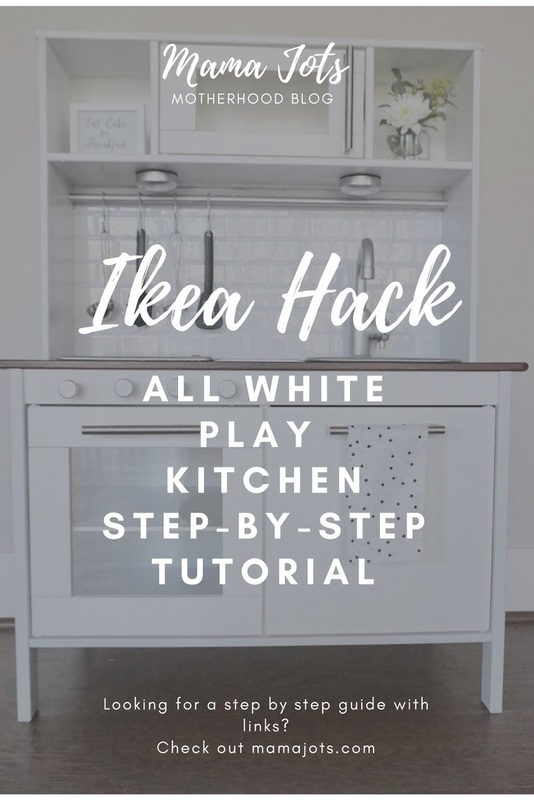 Follow and complete the assembly directions for Ikea's Play Kitchen (if they get lost during steps 1-4, you can print them off on their website!). Be sure to leave out all three handle bars, as you'll upgrade them later. Place the poster board against the upper back half of kitchen. Then trace with a pen or pencil along the inside to create your frame for the back-splash. Cut along the trace of the poster board with an exacto knife or scissors, leaving about an inch on the top and bottom to help secure your board onto the kitchen with a glue gun. Using the self-adhesive stick on back-splash, start with the bottom of your poster board and work your way across and up to fill the frame. Complete until the entire traced area on your poster board is covered. Now you have your backsplash! TIP: I wrapped the remaining self-adhesive stick on backsplash around the edge of the poster board to create a more finished look. 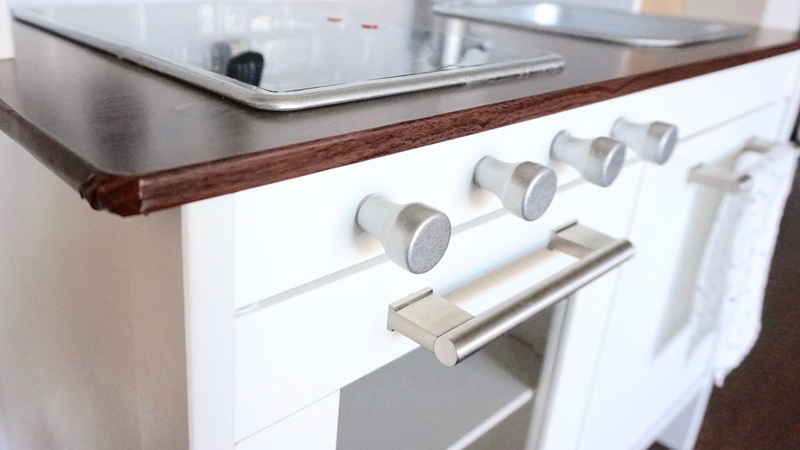 Use a glue gun and white adhesive tape to secure the board to the back of your upper kitchen. the marked spot to create holes so you can screw in all four oven knobs. 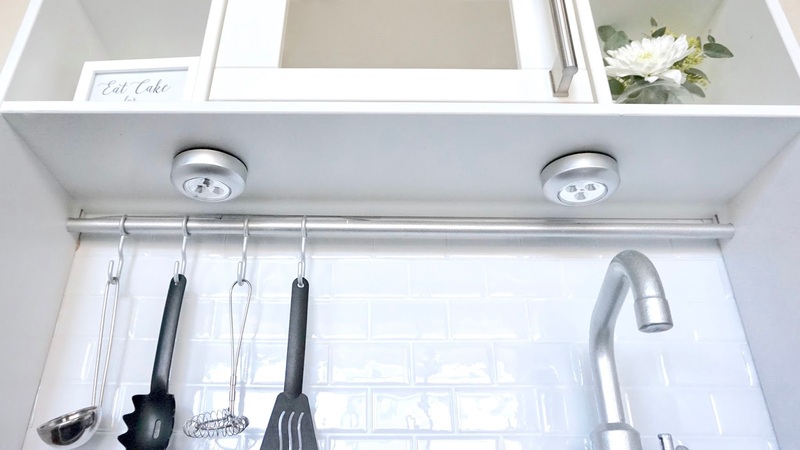 Next secure all three handles bars and click in place your stove and sink.Then stick on two tap-on lights under the upper part of your kitchen. Add some fun details! 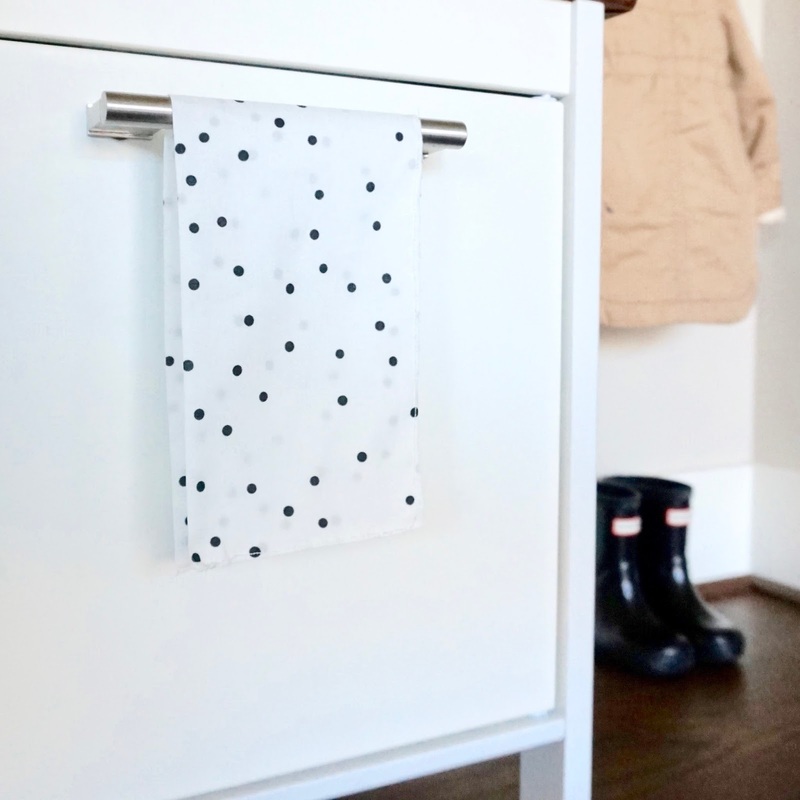 I ordered the polka dot print fabric from spoon flowers and sewed up the edges to create Abby her own little personal wash cloths. I want to thank each one of you for reading and following along. You're support and encouragement means so much to me! Click on the pin button below and save this post for later when you go to put everything together. Also always, let me know if you have any questions!